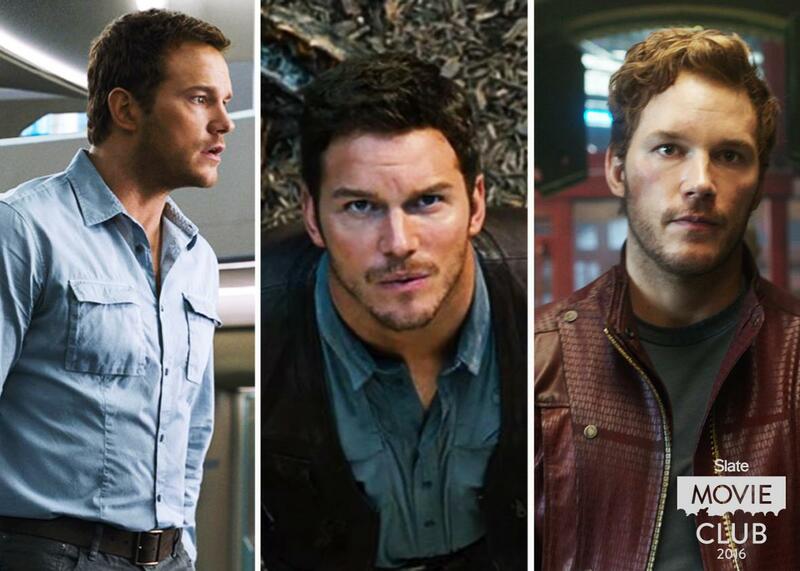 Chris Pratt in Passengers, Jurassic World, and Guardians of the Galaxy. Hope you New Yorkers have recovered from your critics award hangovers! Bilge, it sounds like you and I play the same star-swap game, where you cross-check a script by imagining other actors in the part. We’re all in agreement that Elle wouldn’t exist without Isabelle Huppert. Huppert has the conviction Elle’s script lacks. You don’t see her acting. You see her character living and chalk up the beats the film whiffs to, er, I dunno, the ineffable complexity of life. Now picture Sharon Stone in the role. Elle would be dismissed as sleaze—and I think Sharon Stone is great. She deserves a character this meaty. But Stone can’t shake off her celebrity. When she walks into the frame, you think “Sharon Stone!” the same way you think “Leonardo DiCaprio!” or “Angelina Jolie!”—other actors who can’t disappear into roles. Instead, they can only pick projects that bounce off their public images. That sounds like a diss. Mostly, it is. Yet, Jackie proved the power of synergizing starring role and star brand. I tend to find Natalie Portman too mannered and self-conscious. She’s too aware of us watching her. Ever since her first films, she’s embodied the male gaze. She’s the Girl You Don’t Deserve, the projection of female perfection, whether she’s a bitty-witty hitman or a manic pixie forcing Zach Braff to listen to the Shins. Hell, that’s basically what Beautiful Girls is about. It’s not easy being perfect. Maybe that’s why Portman tore into her Oscar-winning role in Black Swan, though even her insanity felt too shiny and polished. But Jackie Kennedy was also all surface. She had to be—the White House demanded it—and Natalie Portman slid into her kitten heels like Cinderella. To the two women, superficiality is a high art. I didn’t think so when the movie started, but I left convinced. Every year, I get more and more obsessed with second-wave Sienna Miller, who generously gives herself over to small parts. Mid-film, I’ve caught myself deducing it’s her by calculating an equation: Is this actress fantastic? Does she look familiar? Probably Sienna. In the otherwise unremarkable Live By Night, Miller gives the supporting performance of the year as Ben Affleck’s no-good girlfriend who gets tossed away in the first act. Ben Wheatley’s High-Rise gave her a bigger role as a no-good neighbor who lolls around in retro caftans. But I’m still anxiously awaiting the official Siennaissance. She’s earned it. I could talk about actors all day. So … I guess I’ll talk about actors all day. I’ll come out and say it: I’m over Chris Pratt. It pains me to say so, in part because I loved his dopey boyfriend on Parks and Recreation but mostly because between the Jurassic World sequels, the Marvel movies, and possibly the rumored Indiana Jones reboot, he’s going to be as inevitable as a winter cold. He’s America’s new sweetheart, like it or not, but he’s too sugarcoated to be much use to the movies. Maybe his agent is to blame, but so far he seems to have braved the leap from TV to film by armor-plating himself himself in candy hearts that beg “Please like me!” He used to have a great smile, but now it feels nervous. He can’t play dark—not even Indy dark—any more than a golden retriever could play Cujo. Part of why Passengers is so reprehensible is that the film stacks the deck by casting Pratt as the intergalactic gaslighter (and murderer, if you don’t buy his romance with Jennifer Lawrence). The producers know you have to forgive Chris Pratt. He’s such a swell guy! Casting Pratt is like Disney picking Tom Hanks to play Walt Disney—c’mon already. But imagine Michael Fassbender or Joaquin Phoenix in the role—someone with fangs—and the battle of the sexes feels fair. While you’re at it, reverse the first and second acts so audiences aren’t forced to empathize with the bro before Lawrence gets to say a word. That film I’d love to see. Pity we can’t remake movies that are two weeks old. I’m also worried the Divergent series sabotaged Shailene Woodley. In March, the dumbest teen franchise released Allegiant, its third tedious and incomprehensibly stupid flick, to such gaping yawns that the fourth film is slinking straight to TV. Woodley, who was so promising in The Descendants, The Spectacular Now, and The Fault in Our Stars, has been so busy leaping on to train cars in post-apocalyptic leggings that she hasn’t had time for a good movie in years. I missed her bit part as the betrayed girlfriend in Snowden—should I hold out hope she can fight her way back? Other acting questions to kick around: Would critics have been so cruel to the talking cat comedy Nine Lives if two-time Oscar winner Kevin Spacey hadn’t voiced Mr. Fuzzypants? Would Silence have been even better if Andrew Garfield and Adam Driver had swapped parts? Garfield’s fine, but he looks too much like a watercolor Jesus. Driver looks corruptible, which makes me more scared for his soul. I’ll close out by running down my favorite acting discoveries of the year: that gasp when you realize you’ve spotted a new star. Did we all swoon over Hail, Caesar’s Alden Ehrenreich the instant his cowboy Hobie Doyle drowned himself in a tuxedo and sputtered, “Would that it ’twere so simple”? Or fall under the spell of The Love Witch’s Samantha Robinson, a beehived beauty who apparitioned out of nowhere as though she found a wormhole from the Valley of the Dolls? I hear Robinson’s still working at a furniture store in Los Angeles—somebody get that girl a contract! If anyone caught the terrific French teen girl gangster picture Divines at this year’s Toronto International Film Festival, you know that 20-year-old Oulaya Amamra, the director’s younger sister, is poised to chase Isabelle Huppert’s career. If you missed Divines, it’s already on Netflix—and while you’re there, check out one of my other favorite movies of the year, Vikram Gandhi’s Barry, which sells itself as a biopic of Barack Obama’s first year at Columbia University. It’s definitely that: Much of the script is borrowed from Obama’s memoir, Dreams From my Father, including the part where Barry (he hasn’t yet grown into Barack) breaks a girl’s heart by bungling his reply to “I love you.” Anya Taylor-Joy, the breakout star of The Witch, plays that girlfriend, an amalgamation of three white women Obama dated in his early 20s. Taylor-Joy was good in The Witch, but here she’s phenomenal. She has these intelligent eyes that seem to take in a scene and convince you she’s living it for the first time. You love her character more than Barry does. Yet, Barry is barely a biography. Despite newcomer Devon Terrell’s immaculate impersonation, the film doesn’t have to be about Obama at all. It’s really a study of race and class that’s as sticky and delicate as a cobweb. At the center is a biracial 20-year-old kid who blends in everywhere and nowhere. He can win over his white classmates and the black guys he plays ball with on the court. He charms Taylor-Joy’s parents and the salesman hawking old paperbacks of Invisible Man on the corner. But it all takes effort. Barry isn’t sure which threads to grab for support, and so he tugs on each of them and snaps a few—part of what keeps this from hagiography is at the end of the film, you want to shake him even though you know he and Taylor-Joy are doomed to split up. Obama’s fated to become half of America’s happiest public marriage. Jackie Kennedy would be jealous. Boy, would I love to see a movie of her ghost haunting the Obamas’ White House and resentfully rearranging their wedding portraits.